Given the gravity and possible impact on Independent Media of this and other account "suspensions" by compromised social media corporations such as Twitter we urge readers to disseminate this report whenever and wherever possible - Ed. Following multiple complaints from CNN and other "mainstream media" organisations regarding coverage and exposure of their repeated publication of false information and blatant propaganda, Twitter has suspended the account of The 5th Estate Asia "CNN_DOA." The action came after Twitter released another statement announcing the pending suspension of "alt-right" accounts, which The 5th Estate Asia cannot be connected to in any way, shape or form legally or philosophically. This account "suspension" was at the behest of CNN, who has repeatedly been exposed by The 5th Estate and other media organisations for their connections to and disseminating propaganda for the CIA and FSA/ISIS terrorists in Syria, Iraq and Libya under the former Obama administration. These account "suspensions" now place Twitter, their assigns, investors and corporate officers in a new light and not simply as censors and tools of so-called "mainstream media" fake news outlets and cable networks, but also as collaborators seeking to silence alternative media critics. 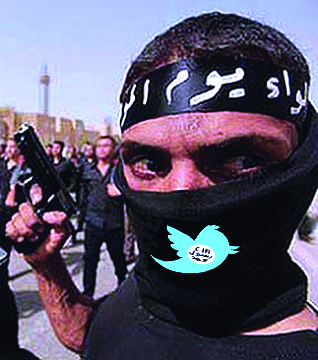 Twitter has a long and documented history of arbitrarily and for no stated reason suspending the accounts of individuals and organisations that do not adhere to their leftist/globalist agendas, while at the same time allowing terrorist groups such as ISIS to not only maintain their Twitter accounts but disseminate anti-U.S. propaganda while at the same time conducting active recruiting efforts on Twitter, making Twitter and it's corporate officers legally and morally responsible for their acts of terrorism committed in the U.S., EU and other Middle East and African countries and more importantly, against U.S. military personnel overseas resulting in death and injury. These account suspensions appear to be a "first strike" on any individual or media organisation that questions the veracity and credibility of CNN and "mainstream media" propaganda that is not only now saturating cable broadcasting stations but also print media and the Internet. 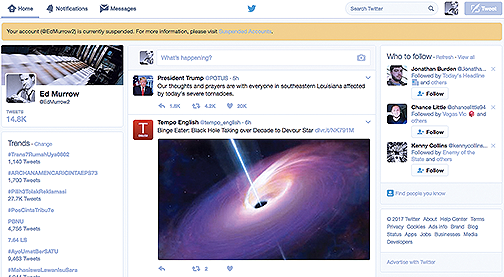 Twitter has also been used as a platform for communications in the organisation of recent riots incited by anarchist groups to commit acts of property damage and violence across the United States during and in the wake of the November elections. 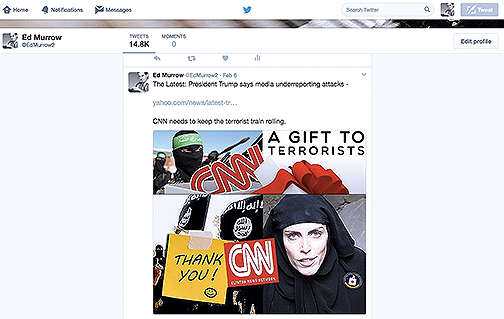 This aiding and abetting of criminal activity on their platform directly exposes Twitter to civil and criminal action, and the Department of Justice under the new administration not only has legal ground to investigate Twitter and it's corporate officers for collusion with these domestic and international criminal groups and terrorist organisations, it has the obligation under Federal law to do so in the defence of national security. 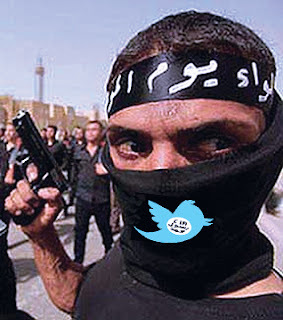 Twitter has for far too long been allowed to skirt issues of censorship while allowing terrorist propaganda to proliferate and expand on their platform, and it is now time for the new Attorney General to thoroughly investigate their support and connections to account holders who have a vested interest in creating social unrest, fostering domestic criminal activity and the expansion of international terrorism in the United States. Robert S. Finnegan is the Editor of The 5th Estate Asia based in Jakarta Indonesia, and is a retired investigative journalist and journalism professor. He may be reached at rsfinnegan@gmail.com or by phone at +62-812-9173-1666.